The other day I was finishing up my Christmas shopping with my Mom. 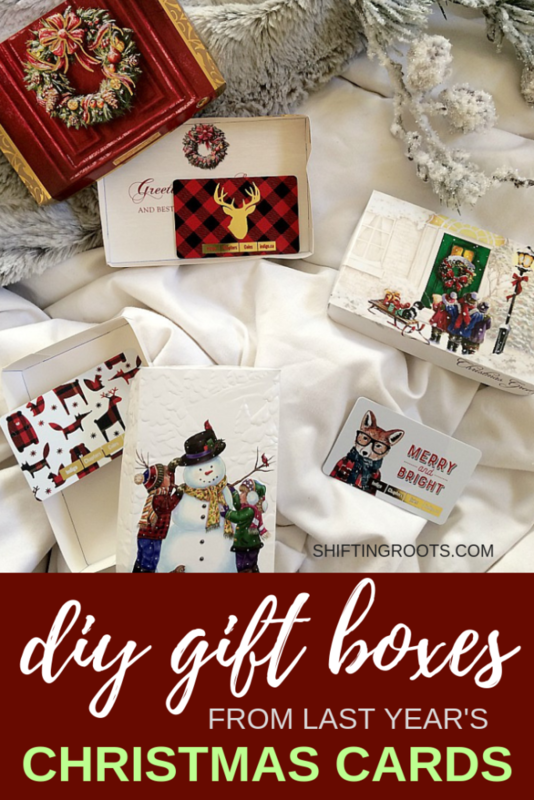 Some sparkly gift card boxes caught my eye and I put them in my cart. They would be perfect for Dominic’s teacher appreciation gifts. Looks like your Mom is always right. 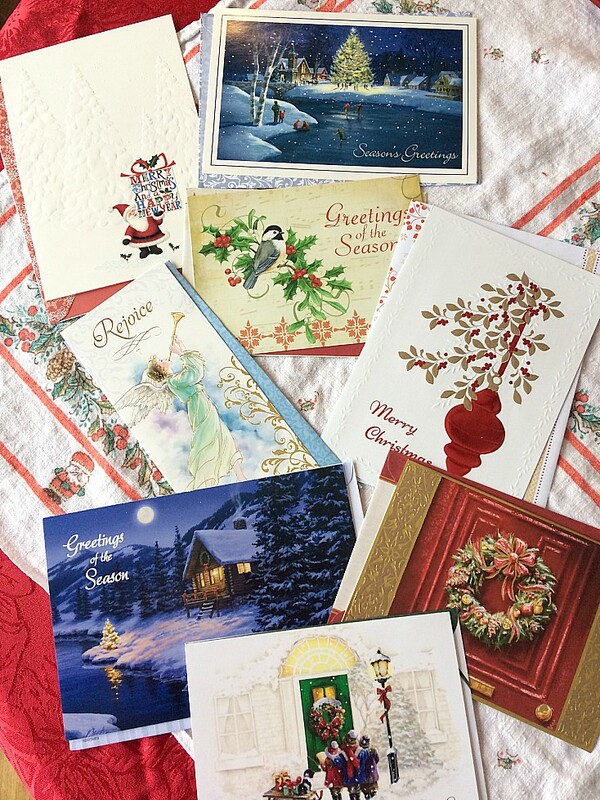 Start by going through last year’s Christmas cards and picking ones you like. Good candidates have a central image and no writing or writing that’s on the side. Most of the cards in the image below are good candidates. The white one with Santa in the corner is not. The Rejoice one with the angel would be good for a necklace or jewelry, but too narrow for a gift card. 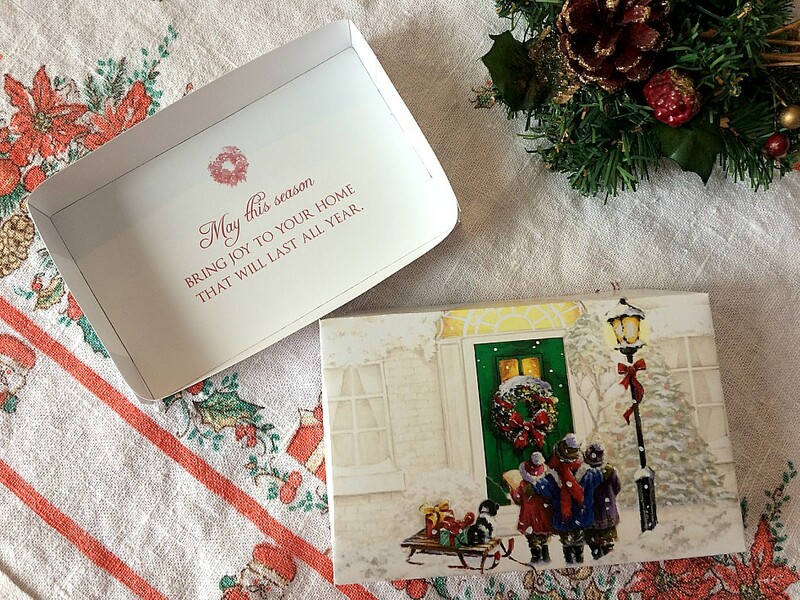 When I started to make the gift boxes, I actually couldn’t 100% remember how we used to make them. The way I’m going to show you is the way I like to make them so I can be in control of how the picture looks on the front of the box. Further down the post, I have instructions for the easy, no-measuring way that my Mom reminded me of. Choose whatever seems easiest to you. Start by cutting your card in half. Trim the bottom piece 3 millimetres or 1/8 inch on one horizontal and one vertical edge. This ensures that your box will close nicely. Draw four lines an equal distance around the inside of your card. I like to look at the front of my card and pick the width based on how I want the picture to look on the front of the box. Cut the card like in the picture above. Fold all the edges in. 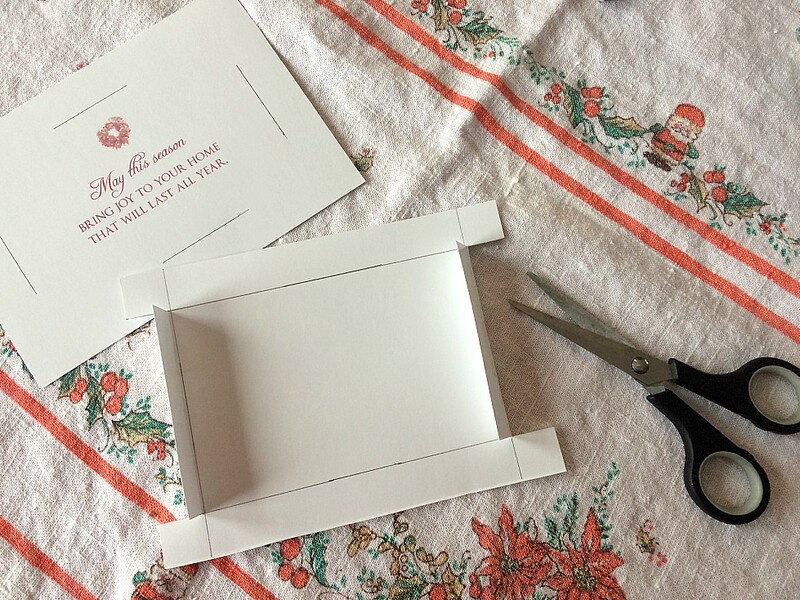 Add glue dots or double sided tape and fold the tabs inside. 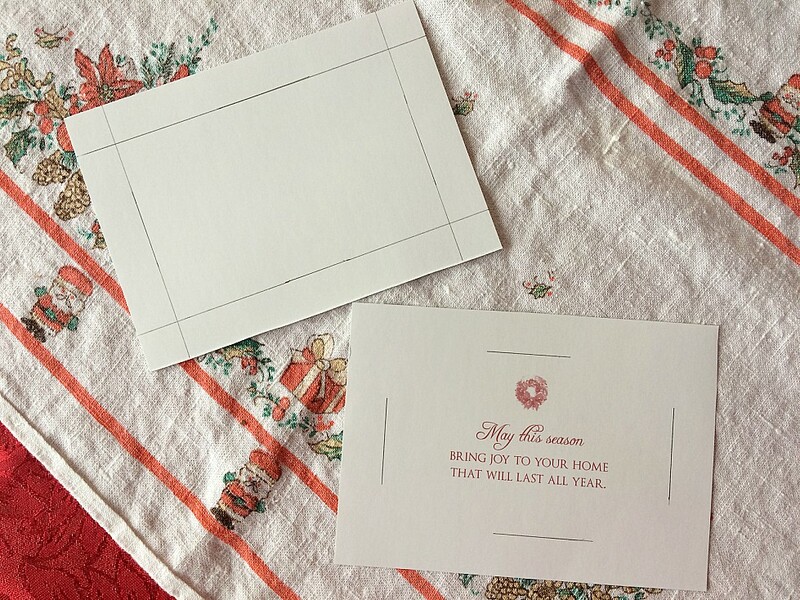 If you’ve centered the card nicely, the recipient will get a lovely message at the bottom. 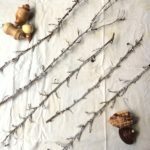 Looking for more cheap and easy Christmas crafts? 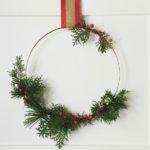 Check out DIY Sparkly Twigs and this Rustic and Minimalist Christmas Wreath. Ta-da! 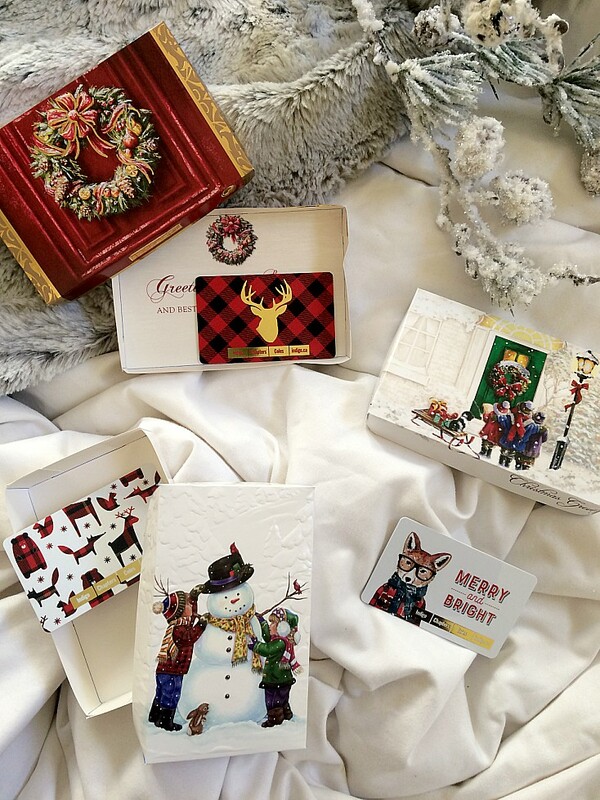 Super cute boxes to put your gift cards in. 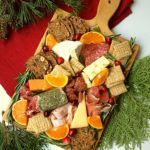 Bonus: the cheapness, up-cycling, and zero waste factor. This way of making boxes is actually easier, but you have less control over how the picture looks on the front of the box. I can tell you from experience that it rarely lines up perfectly unless the subject is dead centre. But! This way is so quick, and will keep my 8-year-old-self your crafty kid occupied for hours. Start by making an X on each side of a cut card. Fold each side to the centre. Cut out tabs as shown in the last example. Fold the tabs in, fold the long bit over, and tape to secure. No matter which method you choose, you’re sure to have a beautiful box. I love this so much. 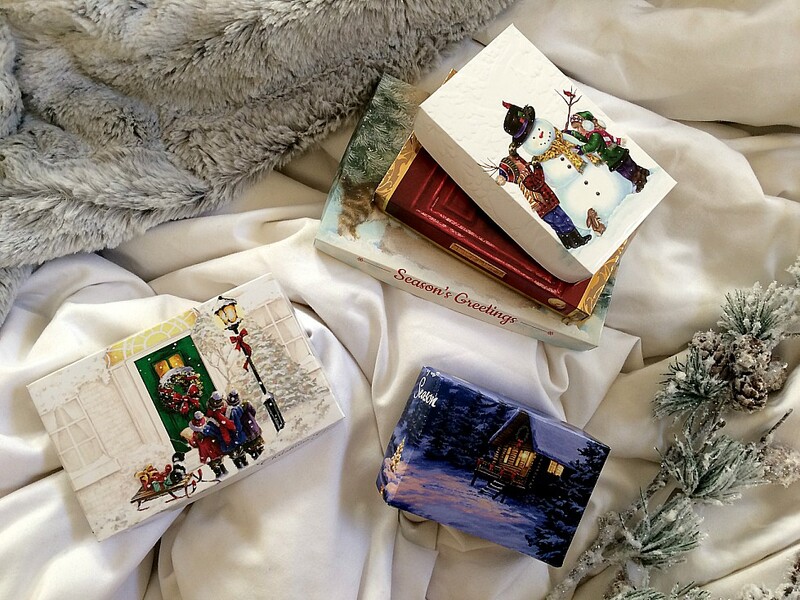 I have always used my older Christmas cards as gift tags on presents (punched a hole and put ribbon through), however, I am definitely going to add this to the mix. I think it looks so eclectic and it is WAY better for the environment. Thanks for the amazing idea Kristen! You're welcome! I like your idea with the gift tags too!